This week I finally got around to reviewing the bottle of 1792 Ridgemont Reserve bourbon that was given to Charlie and I over Christmas. Of course that doesn’t mean the bottle hadn’t been opened, just that I hadn’t actual sat down with it to really savor and contemplate the flavors. It is a good problem to have when your liquor cabinet is so full that you are spoilt for choice when it comes to what to write about. 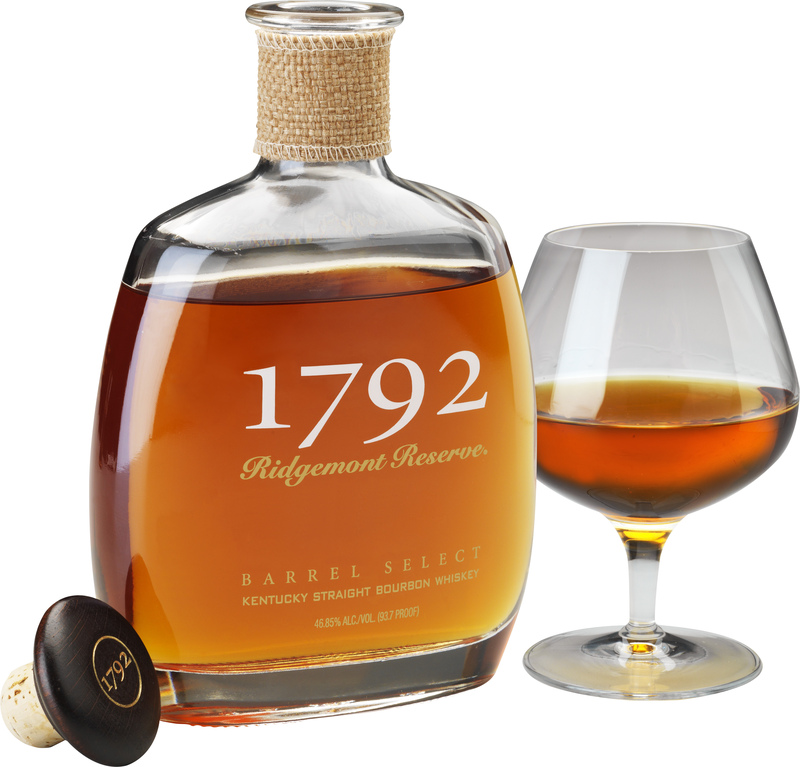 1792 is a small batch bourbon put out by Barton Brands Distillery in Bardstown, Kentucky which also puts out Very Old Barton and Kentucky Tavern. The 1792 is 93.7 proof and aged for eight years. It also happens to be the official toasting bourbon of the Kentucky Bourbon Festival. The retail price is usually in the $22-26 range which puts it cheaper than Woodford Reserve and in a similar range to Knob Creek. The 1792 is commonly available at most liquor stores in Ohio, Kentucky, and Indiana. This is a very nice choice for a sipping bourbon, especially if you like a high rye content to your whiskey. I was drinking it neat as I reviewed it and found it enjoyable. The nose has fruity notes and I got the smell of bananas and vanilla in addition to a nice spicy prickle of grain. The alcohol content is high enough to give a satisfying burn on the finish but mellow enough to allow you to really savor the drink before swallowing. The 1792 doesn’t have the strong sweet taste on the front like some other premium bourbons do. The rye really came through with its trademark spiciness and buzz to the tongue. This made it more difficult for the sweeter side of the bourbon to come through but I did get the softer flavors of apple and vanilla. The finish had a strong oak kick with a little bit of cloves and coffee. I found this bourbon to be different enough to be engaging but perhaps heavier on the rye than I personally enjoy. You won’t find the dramatic highs and lows of something like Booker’s but then I wouldn’t expect that of a bourbon at this age and price. On the other hand it is a more complex flavor experience than something like Town Branch which is actually more expensive than The 1792. Basically it all comes down to what you enjoy. If you like ryes and have less of a sweet tooth than other bourbon drinkers this is going to be an excellent match for you. If you really go for sweetness or a mellow gentleness from your bourbon this might not win you over as quickly. Either way I can objectively say that this is a well-crafted bourbon for the price and something I would consider giving as a gift myself. You can hear the tasting that inspired the review on Episode 62 of The Charlie Tonic Hour.